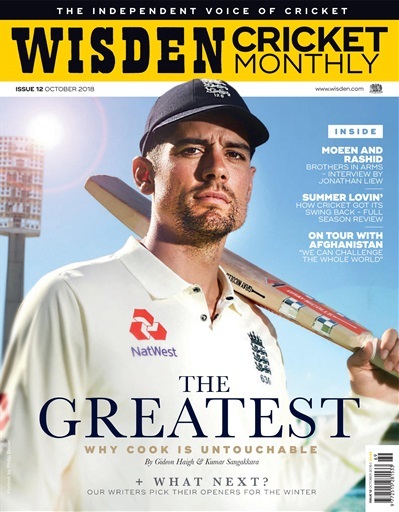 (0 Customer Reviews) | Write Review 12 issues per year Wisden Cricket Monthly is the world’s leading magazine when it comes to coverage of cricket in the modern day. Wisden Cricket Monthly magazine returns from a hiatus with its customary in depth-articles by the best cricket writers in the world. Inside every issue, you will find interviews with some of the sport’s leading names, like Joe Root, Alastair Cook and Steve Smith. Alongside this, you can enjoy the comprehensive analysis of the game at club, county and of course, international level. Whether it’s test, one day or Twenty20 cricket that you love, you’ll find it all in the digital pages of a Wisden Cricket Monthly magazine. Content in Wisden Cricket Monthly doesn’t stop at the analysis of the game, you’ll also find coaching tips and practice advice, as well as guides to the latest equipment, regular book reviews and competitions! Stay right up to date with the sport you love - subscribe to Wisden Cricket Monthly digital magazine today and never miss another issue! In the latest issue of Wisden Cricket Monthly, Gideon Haigh and Kumar Sangakkara reflect on the career of Alastair Cook after England’s record run-scorer’s emotional farewell to international cricket. Elsewhere, Jonathan Liew talks to Moeen Ali and Adil Rashid about their enduring friendship and representing the diversity of England. We also pick out the major stories of the summer, including Surrey’s first Championship title for 16 years; Phil Walker hails the impact of England's chief selector Ed Smith; Worcestershire's Daryl Mitchell reflects on a tough year for opening batsmen; and Ben Gardner meets the Afghanistan squad on their tour of England and Ireland and asks what's next for Test cricket’s newest nation. Wisden Cricket Monthly is the world’s leading magazine when it comes to coverage of cricket in the modern day.